Allium such as onion, garlic, leek, etc., solanaceous such as pepper, tomato, potato, etc., beans, cucurbits, lettuce, cereals, cassava, cotton, coffee, strawberry, raspberry, banana, mango, citrus, and other fruit trees. Anthracnose disease attacks all plant parts at any growth stage. The symptoms are most visible on leaves and ripe fruits. At first, anthracnose generally appears on leaves as small and irregular yellow, brown, dark-brown, or black spots. The spots can expand and merge to cover the whole affected area. The color of the infected part darkens as it ages. The disease can also produce cankers on petioles and on stems that causes severe defoliation and rotting of fruits and roots. 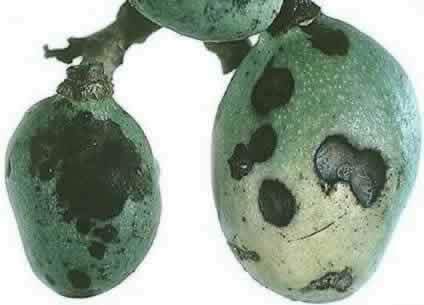 Infected fruit has small, watersoaked, sunken, circular spots that may increase in size up to 1.2 cm in diameter. As it ages, the center of an older spot becomes blackish and emits gelatinous pink spore masses. An early symptom of infestation is damping-off due to the cotyledon's rotting. Infected leaves have pinkish-brown spots that appear especially on their under surfaces. Large areas of the tissues around the veins become yellowish to brownish and eventually dry out. The fungus causes pink boll rot. It first appears as small, rapidly expanding, reddish-brown spots on the capsule that blacken as they age. Then the surface of the boll is coated with thick, grayish to pinkish mycelium which leads to the growth of small black fruiting bodies of the fungus. On cucurbits, leaf spots are often large, about 10 mm in size and pale-brown to gray in color. with distinct margins. 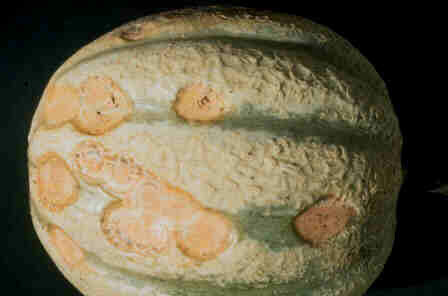 The lesions on fruit appear as brownish discolorations, often 20 - 30 mm diameter that become sunken, wrinkled and dark, with concentric rings of fungal fruiting bodies. 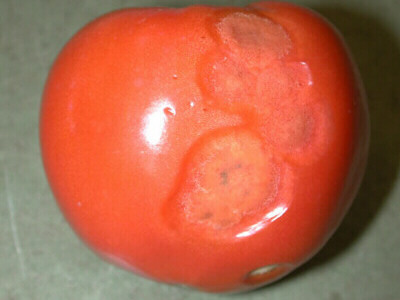 Infected ripe tomato fruit has small, watersoaked, sunken, circular spots that may increase in size up to 1.2 cm in diameter. As it ages, the center of an older spot becomes blackish and emits gelatinous pink spore masses. The anthracnose lesions easily attract other rotting organisms to completely rot the infected fruit. 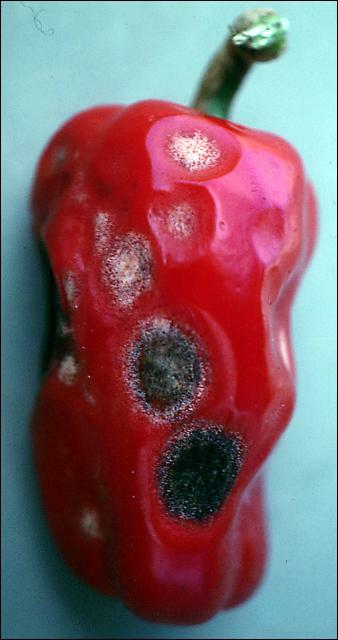 Infection may also occur on unripe fruits, stems, leaves, and roots. Infected unripe fruits do not show symptoms until ripening. Infected roots, called black dot root rot, only become evident when the fruits begin to ripen. The root lesions become brown and are dotted with fruiting bodies. The outer layer of the infected roots is completely rotten. On green fruit, the peel has dark-brown to black diamond-shaped lesions about 8 x 3 cm in size. The lesions are sunken with pale margins. Orange fungal fruiting bodies are found growing on the lesions. On yellowing fruit, brown spots initially appear that later become sunken and covered with orange spore masses. A tip rot may develop and can rot the entire fruit but the pulp is usually not affected unless the fruit is overripe. Anthracnose on beans appears on leaves at all the growth stages of a plant but often appears in the early reproductive stages on stems, petioles, and pods. It generally appears first as small and irregular yellow, brown, dark-brown, or black spots. The spots can expand and merge to cover the whole affected area. The color of the infected part darkens as it ages. The disease can also produce cankers on petioles and on stems, causing severe defoliation. On infected cereals, leaves have brown, oval or elliptical spots (up to 1.2 cm in length) with a dark brown or purplish border that is often surrounded by a yellowed zone. There may be black speckles within the dead tissue. On corn, small, round to irregular, watersoaked spots first appear on the lower leaves. Spots later turn yellow and then brown with reddish- brown borders. 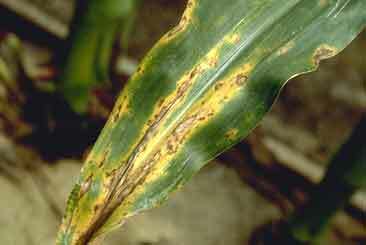 Yellow zones often develop around the leaf spots. Numerous spots expand and join all together causing the leaf tips or the entire leaves to turn yellow. On sorghum, the infected leaves have oval black lesions, less than 5 mm in diameter that develop into circular, straw-colored centers with wide margins that may vary in color, from reddish to blackish purple. The infested stalks, panicles, and grains rot. Onion smudge may appear at all growth stages but it is more common on bulbs approaching maturity and during storage. The disease affects the scales and lower portions of the unthickened leaves which constitute the neck of the bulb that appears as minute, sunken, yellowish spots that can enlarge and join together. Infected leaves have oval, greenish or yellowish-gray spots with yellow halos that turn dark as they age. The infected leaves and fruits have small or large lesions, or purplish or brown patches without the formation of definite lesions. The stems and petioles have girdles and the inflorescences turn yellow, causing dieback and shrivelling. The fruit usually develops lesions during the ripening process, but lesions may develop on fruit of any size and possibly on the foliage and stems at later stages of infection. As the fruit ripens, its susceptibility to infection increases. The lesions on the fruit are circular and may reach 3 cm in diameter or bigger on the larger fruit. The concentric rings at the center of the lesion may be tan or orange to black. Initial infections are undefined tanned colored lesions that may appear in a matter of a few days after infection.